Pocket chainsaws are great for using in a pinch. They can saw through surprisingly large logs and then store away easily in your pack. But not all pocket chainsaws are created equal. There’s a few models you’ll want to avoid, and there’s a few pocket chainsaws that really stand out as best in class. I’ve done all the leg work for you and compiled a list of the best pocket chainsaws below. The Sportsman Industries’ Pocket Chainsaw is durable, easy to use, and portable design convinced us to name the Sportsman Industries pocket chainsaw as the best pocket chainsaw. The Sportsman Industries pocket chainsaw is perfect for throwing into your backpack wherever you go camping and venture into the wilderness. The pocket chainsaw gives you the power to saw through thick 12”+ wood and trees to process firewood, clear a path, or get yourself out of an emergency situation. Given how compact and lightweight this pocket chainsaw is at only 0.3 lbs, it can’t hurt to pack one just in case. The pocket chainsaw blade is made of durable high carbon steel. High carbon steel gives the saw teeth a tough edge that can stand up to endless sawing of greenwood and hardwood with ease. The pocket chainsaw’s blade resembles standard chainsaw blades and essentially serves the same purpose. The pocket chainsaw’s blade resembles standard chainsaw blades and essentially serves the same purpose. The sharp teeth saw away at wood just like a chainsaw does, only with your own hard labor instead of a motor. Whatever you can cut with a chainsaw, you can take on with this pocket chainsaw given you have enough time, patience and effort. If you ever need to sharpen the pocket chainsaw blade, you can use the same techniques and tools as you would sharpening a chainsaw blade. You’ll appreciate the Sportsman Industries pocket chainsaw if you’ve ever used cheaper pocket chainsaws. Cheaper pocket chainsaws’ blades look like a nail file compared to the real-deal chainsaw blade of the Sportsman Industries pocket chainsaw. One aspect that sets this pocket chainsaw apart from other pocket chainsaws is durability. A pocket chainsaw is no good if it breaks within a few hours of use. This pocket chainsaw is secure to its chain via a durable handle ring system that makes it unlikely to break even during hard sawing. Cheaper saws tend to break at the loops on the end of the chain where the handles connect, but we saw no signs of wear. We give the Sportsman Industries pocket chainsaw high marks for durability. Another thing we liked about this pocket chainsaw was the portability. The Sportsman Industries pocket chainsaw truly cuts like a chainsaw, albeit with a lot more work and patience required. The 36” model weighs in at only 0.3 lbs, making it easy to carry for even the most bare bones backpackers and survivalists. This pocket chainsaw is possibly the best bang-for-your-buck tool when it comes to weight. Carrying a pocket chainsaw that weighs only 0.3 lbs and can handle the same jobs as a regular chainsaw is powerful. The lightweight design of this pocket chainsaw also makes it useful for sawing tree limbs that are high off the ground. Instead of calling a professional tree clearing company, you can instead clear the high up tree limbs yourself. Tie a rope through one of the loops and throw the pocket chainsaw over a tree limb. Grab the pocket chainsaw once it goes over on the other side, tie a rope through the other loop, and pull it back up to the branch. You now have a sharp pocket chainsaw over the tree branch while you’re firmly planted on the ground. Saw the pocket chainsaw back and forth. With enough patience, you’ll saw through the tree branch. You can save yourself money by avoiding having to hire professional tree workers without having to get on a ladder or worry about falling out of a tree. 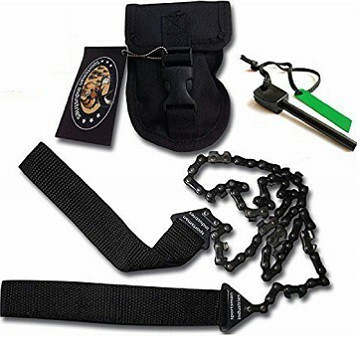 Also included with the Sportsman Industries pocket chainsaw is a carrying case and fire starter. The carrying case is great for storing the pocket chainsaw after sawing through wood since sap and tree gum tend to stick to saw blades. The carrying case serves to keep other gear in your pack clean, prevent damage to the saw blade and other equipment, as well as keeping the pocket chainsaw rust free by protecting it from the elements. The case is made of durable nylon and easily packs away into a backpack pocket or bag. The fire starter is nothing too special. It’s a magnesium fire rod that creates hot sparks when struck by the tethered steel scraper. You can use it to light tinder and kick start your campfire. Keep the fire rod handy for when you want to light all the firewood you saw processed with the pocket chainsaw, just don’t forget your tinder. One thing we didn’t like about this pocket chainsaw is that it’s tiring to work with. Regardless of which pocket chainsaw you use, it’s hard work. Sawing will take the energy out of you once you’ve done 15 or so logs. Overall, the Sportsman Industries pocket chainsaw is a great lightweight and effective pocket chainsaw that can tackle the toughest trees and limbs. The saw easily packs away into any bag or backpack and weighs only 0.3 lbs for the largest model. The pocket chainsaw has a true to design chainsaw blade made from high carbon steel that’s just as sharp as the real deal. If you’re looking for the best pocket chainsaw for camping, prepping or outdoor recreation, we’d recommend you check out the Sportsman Industries pocket chainsaw. LivWild’s pocket chainsaw is packed full of great features that turn it into a portable yet powerful pocket chainsaw that can handle near any size log or branch. The most important feature about this pocket chainsaw is the sharp 26” heat-treated industrial chain. Heat-treatment makes it a super durable steel that holds a sharp edge even after a day of sawing tough grain wood. Another neat feature about this saw is that it has self-cleaning teeth that push gunk and junk out of the saw teeth and links when sawing. This means less cleaning for you, giving this saw good points for easy maintenance. Unlike cheap plastic handles, the durable double-stitched handles hold great even when you need to muscle the saw hard for tough cuts. The double-stitched handles can be wrapped around your wrist for more control. Another use is threading rope through the saw so that you can saw a high tree branch while standing safely on the ground. Portability is an important factor for pocket chainsaws. After all, if portability wasn’t an issue, then you’d be better off choosing a full-size chainsaw! This saw weighs about 0.6 lbsand fits inside its nylon carrying case snugly. The carrying case takes up about 4 x 4 inches but is maybe only 0.3-inches thick. Easy to store in a side pocket on your backpack or in a tool drawer in your garage. Also included with this pocket chainsaw is a PDF survival guide and a mylar survival blanket. Some may find the survival guide helpful, but I personally think the mylar blanket is a more exclusive bonus. It easily folds into a portable package that is worth a spot in your pack just in case you run into any trouble while out in the wild. While it’s simply an afterthought compared to the pocket chainsaw itself, it’s a nice extra that may sway some people’s decisions. Overall, LivWild’s survival pocket chainsaw is a great little package that is sure to please any outdoor enthusiast. The sharp 26” chainsaw blade chews through branches and logs without much resistance, however you may find it doesn’t cut as well when it lacks tension. If you keep the saw under tension, it’ll blast through most anything you can get it around. I like the hi-contrast double-stitched orange handles the securely connect to the chain and give you plenty of heft to muscle the saw with. Plus, you can also thread a rope through the handles for sawing high tree branches while on the ground. The included bonuses of a PDF survival guide and mylar survival blanket are a nice touch, giving a real sense of value to this package. If you’re looking for one of the best pocket chainsaws for the money, I recommend you check out the LivWild pocket chainsaw package. Supreme Glow’s pocket chainsaw packs lots of power into a small and durable package that makes clearing trees and branches a breeze. One of the best features about this 28” saw is the heat-treated steel that is more durable than standard steel. Heat treatment also makes the steel hold an edge better, meaning you can saw more and worry less. Plus, the steel also comes with a rust-resistant coating. This coating also helps the saw keep a sharp edge even after sawing in wet and nasty conditions that would normally tarnish other steels. Opposed to other pocket chainsaws that have nylon sheaths, this saw comes with a tin that it securely seals inside. This means no chance of water getting inside the packaging, potentially rusting and ruining your saw’s edge. The whole package weighs about 0.5 lbs, making it easy to slip into a side pocket on your backpack when camping, hiking or backpacking. This saw also comes with plastic handles that attach via looped nylon cording to the metal saw rings. While it’s a unique way to approach a set of handles, I think the thick double-stitched handle design is a bit sturdier and more intuitive. These handles look kind of cheap, but they get the job done. My only caveat I have with this saw is how the teeth differ from the conventional chainsaw teeth. These are more geometric and plain, and not like typical chainsaw teeth. Chainsaw teeth do a pretty good job of cutting through both wet wood and dry wood, leaving the effectiveness of these teeth to be questionable. But so long as you keep them under tight tension when cutting, they should still saw through wood just fine. I find the handles a bit awkward to keep high tension on this saw, but it’s something you get used to after a short while of using. Overall, Supreme Glow’s pocket chainsaw package is a great choice for those who are wanting an easy-to-carry and no worry pocket chainsaw. The metal tin seals the saw from the elements even during wet and nasty conditions like a bad rain storm. Throw in the rust-resistant saw blade coating and this saw is ready to take on humid and wet climates. I find the handles to be a bit awkward and prefer the double-stitched design of the other two pocket chainsaws on this list. But if they fit your fancy, you may end up liking them better. It’s also easy to make your own handles for this saw if that’s something you’re looking to do. Pocket chainsaws are helpful and lightweight tools that are great to have when camping or preparing for a survival situation. Pocket chainsaws act like manual chainsaw blades and cut through surprisingly large logs. While not as effective as the best folding saw, pocket chainsaws are easier to pack and carry for when they are needed most. A good pocket chainsaw will save you significant amounts of time when gathering firewood for your campfire or survival fire. With enough patience and effort, you can saw through even the thickest limbs and trees.